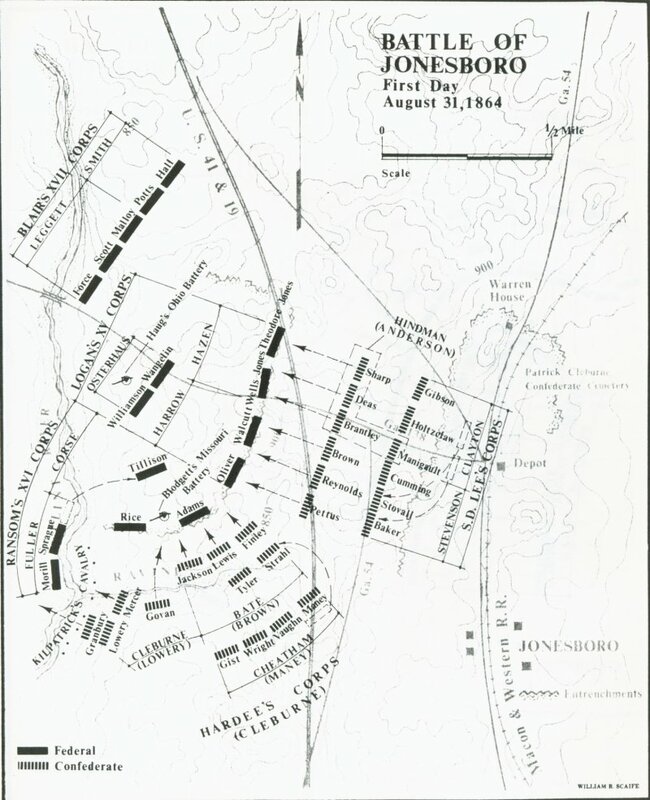 The Battle of Jonesborough (modern name Jonesboro) was fought August 31–September 1, 1864, during the Atlanta Campaign in the American Civil War. Two Union armies led by Maj. Gen. William T. Sherman maneuvered to draw the Army of Tennessee (led by John Bell Hood) away from their defenses at Atlanta, Georgia, where it could be destroyed. Although Hood's army was not destroyed, the city of Atlanta was abandoned and then occupied by Union troops for the rest of the war. The fall of Atlanta also had far-reaching political as well as military effects on the course of the war. In several previous raids during the campaign, Sherman had successfully (but temporarily) cut Confederate Gen. John Bell Hood's supply lines by using small detachments, but the Confederates had always quickly repaired the damage. Late in August 1864, Sherman believed that if he could completely sever Hood's supply line Macon & Western and the Atlanta & West Point Railroads—the Confederates would be forced to evacuate Atlanta. Therefore, Sherman elected to move six out of his seven infantry corps against the Confederate supply lines. The Union army began pulling out of its positions on August 25 to hit the railroad between the towns of Rough and Ready and Jonesborough. To counter this move, Lt. Gen. William J. Hardee and two Confederate corps—Hardee and SD Lee—were sent south to Lovejoy Station to halt and if possible rout the Union troops. However, Hood failed to realize most of Sherman's army was approaching there in force, causing Hardee and his command to be highly outnumbered. Map of Jonesborough Battlefield core and study areas by the American Battlefield Protection Program. 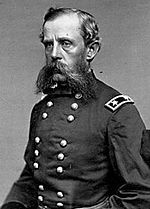 On August 31, Union Maj. Gen. Oliver O. Howard had two corps entrenched on the east side of the Flint River. John A. Logan's XV Corps dug in on high ground facing east and the Macon & Western Railroad. The XVI Corps, now led by Thomas E. G. Ransom formed a right angle connected to Logan's right facing south. Frank Blair and the XVII Corps were in reserve west of the Flint River. Hardee left Patrick Cleburne in command of his own corps while he directed the two-corps assault. Cleburne would move north on the left from Lovejoy Station and attack the Federal line held by Ransom, while Stephen D. Lee was to make the secondary attack on the right against Logan's line. Cleburne's lead division, led by Mark Lowrey, moved northwest, and just as it was turning north toward the Federal lines, Lowrey was unexpectedly hit by H. Judson Kilpatrick's dismounted cavalry, concealed behind fence rails and armed with Spencer repeating rifles. Kilpatrick's fire was so effective that Lowrey broke off from his attack against Ransom's main line and directed his entire division west against the Union cavalry. Lowrey succeeded in driving off the cavalry, but instead of returning to his original goal, he pressed the cavalry across the Flint River and was eventually stopped by Giles A. Smith's division from the XVII Corps west of the river. SD Lee mistook the firing between Lowry and Kilpatrick as the main assault and attacked well before Cleburne's troops had actually gone into action with Ransom. Lee ordered a frontal assault that was vigorously led by J. Patton Anderson. General Logan, from the Federal lines, admired Anderson's bravery in the battle before he was shot down. Lee's troops were repulsed with heavy casualties. After Lee's troops had been defeated, Hardee wished to renew the attack. However, Lee informed him his troops were in no condition to do so. Indeed, Lee had suffered a disproportionate 1,300 casualties to Cleburne's 400. Both were disproportionate to the Federal total of 179. Learning of Hardee's inability to dislodge Federal forces at Jonesborough and fearing a direct attack on Atlanta, Hood withdrew Lee's corps from Hardee's force that night and into the city's defenses, a move that would have great consequences the following morning when fighting resumed. Hood later described the fighting on August 31 as a "disgraceful effort" because the number of Confederate dead was minimal compared to the forces engaged. By 4:00 p.m. Stanley's corps still had not yet arrived on the battlefield, and Sherman ordered Davis to make an attack on a Confederate salient held by Cleburne. The apex of the salient was held by Daniel Govan's brigade. Davis made an initial attack, led by a brigade of U.S. Regulars, which was easily repulsed. Next, he positioned all three of his divisions for an assault. Absalom Baird was in the center, with James D. Morgan on the left and William P. Carlin on the right. John A. Logan's XV Corps also moved up on Davis's right. Baird personally led a bayonet charge, which earned him the Medal of Honor. The Confederates held on tenaciously, but after hand-to-hand combat Baird's men broke through, capturing Govan and 600 of his men. Davis's men poured through the breach while Stanley's corps finally arrived on Davis's left. Despite the overwhelming force of the Federal attack, Hardee managed to push three reserve brigades—Vaughn, Lewis, Gist—forward to the northern salient, blunting the Federal's penetration of the Confederate line. Vaughn slammed directly into the breach, plugging the gap. And, Lewis and Gist extended the northern Confederate line east to protect the far right, preventing the Federal Infantry from rolling up the Confederate line and destroying the entire Corps. Historians debate whether exceptional generalship by Hardee or the onset of darkness saved the Confederate Corps. Whichever, the remains of Hardee's Corps managed to retreat south in good order to Lovejoy Station. On the night of September 1, Hood evacuated Atlanta and ordered that the 81 rail cars filled with ammunition and other military supplies be destroyed. The resulting fire and explosions were heard for miles. Union troops under the command of Gen. Henry W. Slocum occupied Atlanta on September 2. But, Hood managed to escape Atlanta with the remains of the Confederate Army of Tennessee in good order and slip past Federal forces at Jonesborough en route to Lovejoy Station where they encamped during the month of September. That night Hood ordered the evacuation of Atlanta. The Union forces did succeed in cutting Hood's supply lines, but they had failed to annihilate Hardee's command. Sherman would finally occupy Atlanta the following day on September 2. This had been one of his major goals in the campaign. The Battle of Jonesborough was the final battle of the Atlanta Campaign, and it caused the besieged city of Atlanta to fall into Union hands. On September 4, 1864, General Sherman issued Special Field Order # 64. General Sherman announced to his troops that “The army having accomplished its undertaking in the complete reduction and occupation of Atlanta will occupy the place and the country near it until a new campaign is planned in concert with the other grand armies of the United States.” The capture of Atlanta greatly aided the re-election of Abraham Lincoln in November, and hastened the end of the war. Hood led his defeated army away from Atlanta and to the west, opening the way for Sherman's March to the Sea and resulting in the virtual destruction of his Army of Tennessee during the Franklin-Nashville Campaign. In 1872 many of the fallen soldiers were relocated and reburied in the Patrick R. Cleburne Confederate Cemetery. The famous fire scenes in the 1939 American film Gone with the Wind depict the conflagration in Atlanta caused by the spreading of fires started when Hood ordered the destruction of military supplies and installations as he evacuated the city. ^ "Infantry Battle » Nash Farm Battlefield & Museum Website". www.henrycountybattlefield.com. Retrieved 2016-03-31. "Rev. Emmeran M. Bliemel – Hero of Battle of Jonesboro: 10th Tennessee Regiment: The first American Catholic Chaplain to die on the battlefield". The National Civil War Chaplains Museum. 2008. Archived from the original on 2012-04-25. Retrieved 2011-10-19. Chaplain of the 10th Tennessee Regiment, he courageously and unselfishly ministered to the spiritual needs of all the wounded, both under fire and behind the lines. He died while giving the last rites to his Commanding Officer, Colonel William Grace. Rev. Bliemel also ministered to the men of the 4th Kentucky Regiment (the Orphan Brigade).